What Does a Technical Engineer (12T) Do? A technical engineer is categorized as Military Occupational Specialty (MOS) 12T. They conduct land surveys and make maps. It's a key role in any Army construction project. 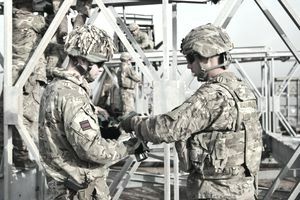 An Army technical engineer has a more lengthy training period than a lot of other military jobs because there's an immense amount of highly technical information these soldiers need to learn. This role is responsible for overseeing construction site development, which includes surveying, drafting and creating construction plans and specs. Total compensation for this position includes food, housing, special pay, medical, and vacation time. If you enlist under certain MOS codes in the Army, you may also be eligible for certain cash bonuses of up to $40,000 if the technical engineer job is considered one of the Army's Jobs in Demand. You may also be able to earn education benefits, such as scholarships to cover the full cost of tuition, a stipend for living expenses, and money for books and fees. Testing: There's no Department of Defense security clearance required for this job, but you'll need a score of at least 101 on the skilled technical area (ST) of the Armed Services Vocational Aptitude Battery (ASVAB) tets. Training: If you choose this MOS, you'll spend the requisite ten weeks in Basic Combat Training (otherwise known as boot camp), and 17 weeks at Fort Leonard Wood in Missouri for Advanced Individual Training (AIT). As with all Army jobs, training will be divided between classroom instruction and on-the-job training. Your training will ensure you know surveying and drafting techniques, how to interpret aerial photography, and the principles of architectural and structural drawing. Other requirements: Normal color vision is required (no colorblindness) and you'll need to demonstrate that you've earned credit for two years of high school math, including algebra, and one year of general science. Since you'll be trained on CAD and other highly technical systems, after serving as MOS 12T, you'll be prepared for a host of civilian construction, architecture, and engineering jobs. Soldiers interested in being a technical engineer outside of the military may be eligible for civilian employment by enrolling in the Army PaYS program. This is not a job for someone who doesn't like working outdoors; you'll spend a lot of time in the field, likely in all kinds of weather. And you'll need to be able to meet the Army's heavy strength requirements. This position typically has a full-time work schedule. Complete Basic Combat Training and Advanced Individual Training. Take the ASVAB Test and achieve the appropriate ASVAB score of 101 or higher for the Skilled Technical area (ST). Make sure that you can meet any additional requirements, such as a background investigation, secret security clearance, and physical strength requirements.